This slow roasting process produces tomatoes that are oven-candied and splendid as antipasto, tossed with pasta or added to a Mediterranean sandwich. Preheat oven to 275 degrees. In a bowl, toss tomatoes lightly with herbs, oil, pinch of sugar and salt and pepper. 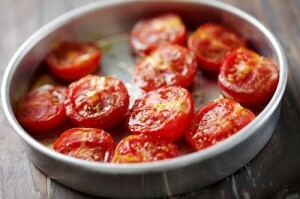 Line a sheet pan with parchment and place tomatoes cut side up. Roast for 1 1/2 to 3 hours. (Timing depends on use and ripeness of tomatoes) Serve at room temperature or keep in an airtight container in refrigerator.